After you purchase a chicken, quail, silkie, or turkey, you can open the Egg Decoration Stand. Customers will come into the shop and make requests for type, theme, color(s), and any optional stickers. The bird that lays the egg your customer asks for will automatically be selected. 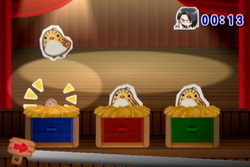 In this mini game, you will be presented with 3 birds, and only 1 of the birds has the egg your customer wants. After the birds mix themselves around, you need to choose the bird that is sitting on the egg. It takes about 12 seconds to pick the bird with the hidden egg. If you select the wrong bird, you will have to play the watching game again. You can buy this Egg Boiler add-on from the Tool Shop for 1500 G. This tool allows you to boil the egg. The egg will drop into a large pan of water. Your task is to hold your Wii remote vertically to control the heat of the burner. Colder water will make the egg sink, and warmer water will make it raise to the top of the pan. Tilt your remote to the left in order to turn the burner down, and tilt to the right to turn up the heat. 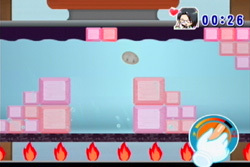 Through the course are block obstacles you need to navigate your egg around. Adjust your water temperature to get the egg from one side of the pan to the other while avoiding the blocks. Every time you run into a block, you will hear a "bloop bloop" watery sound. This sound will indicate that you won't get the maximum 800 points possible. Each time you bump into something, your score will decrease. The next step is to dry off the egg by rolling it around a maze. 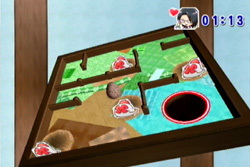 The Egg Roller can be bought from the Tool Shop for 2000 G.
To move the egg through the maze, hold the Wii remote horizontally and tilt it in the direction you want the maze table to tilt. The more you tilt your Wii remote, the farther your table will lean. The goal is to put the egg through the hole at the end. The first two maze tables do not have any obstacles to slow down your path. Once you reach the third maze table, chicken nests will appear along your path. If your egg rolls into a nest, you will have to wait for 3 seconds before your egg will dislodge. This also lowers your mini game score. On the last maze table, large cows will be in your way. If your egg hits a cow, it will be bounced backwards and your end score will decrease even more. You have to gently tilt your Wii remote to carefully maneuver around the cows. Getting the extra large Turkey egg through the maze without hitting a chicken nest or a cow is very difficult. If you try to be very careful around the animals, you risk angering your customer because you are taking too long. Now you have to decorate your egg. At the start of the mini-game, you will be reminded of what your customer requested. This takes a few seconds to display and there's no way to cancel if you happen to remember what they wanted in the first place. The first thing is to paint the requested color by using the pens at the bottom of the screen. Select the pen you want and press A, then wave your remote over the egg. If the customer asks for two colors ("painted red and blue"), then you can just swipe each color over the egg in any pattern you want. If the customer asked for a half-color ("painted half red, half blue") then the first color they request must be painted on the top-half of the egg, and the second color painted on the bottom half. 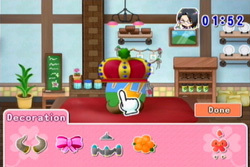 The second screen is where you can attach stickers; star, heart, bolt, flower, butterfly, and clover. If the customer asked for small stickers, you need to move your Wii remote closer to the screen to make the sicker smaller. Move your Wii remote further away to make the sticker increase in size. The customer will ask for either a specific number of stickers, or just a type without any amount. If he/she says just a type ("hearts and stars") then placing 1 of each should be fine. The last step is to complete its theme. You have to choose from horn, ribbon, rocket, flower, crown, or chicken theme. If the customer requests a theme, you only have 1 to select. This extra 800 points is only available if you have bought the Turkey that is included in the Egg Stand add-on package.